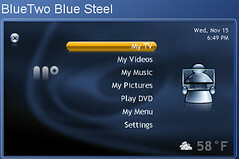 If you've ever spent any time on one of the HTPC forums on the net you know that Home Theater PC fans can be a demanding bunch. That demanding mentality comes from desire of HTPC owners to have the most powerful, flexible and attractive media center available. 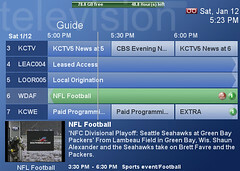 Over the years, SageTV users have taken advantage of the flexibility of SageTV to develop many plugins and replacement menus to take their SageTV HTPC software and enhance it. 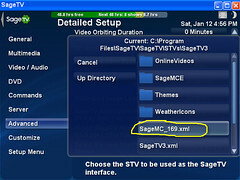 One of the most popular and frequently updated add-ons is the SageMC replacement menu interface for SageTV. 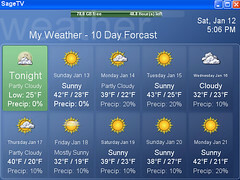 SageMC is a user-developed, user-interface replacement. 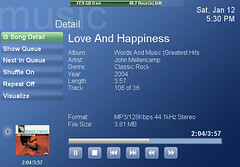 Its called SageMC (short for Sage Media Center) and adds numerous features and totally revamps the menu interface to look and feel more like Microsoft's MCE menus. To leave it at that would do SageMC a disservice as it has evolved into something so much more than MCE and even SageTV. 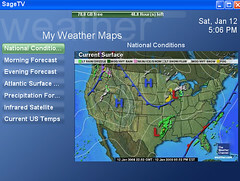 I wanted to take you on a tour of SageMC to highlight the features and screens of this HTPC user interface. Keep in mind as you look at these screen-shots that if there's anything you don't like about the way the main menu looks, you can now change it to suit your hearts desire. 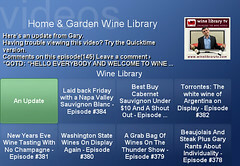 A new "My Videos" page that catalogs your archived movies in video or dvd format on one page. This can be viewed by list or folder and by genre, groups and file system. 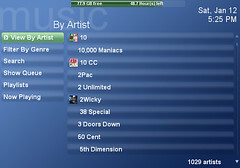 A new "Music" page that shows music in an organized format by genre, artist, album, folder and song. All of this can be sorted by Artist, time or title. 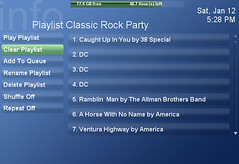 There is an integrated music search, playlist and now playing page built into this menu. 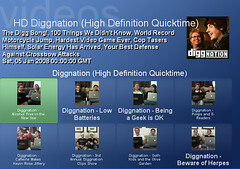 A Pictures page similar to the default SageTV pictures page. Built-in integration of IMDB search with cast, locations, quotes, trivia, description and other information available. 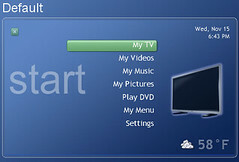 SageMC can be set to automatically import pictures from IMBD for television shows, videos and movies. Integration of Online Videos (same as SageTV) including YouTube, Google Video and a host of other online video content including podcasts. 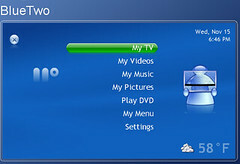 Built in commercial skip monitoring along so once you get comskip installed, it will detect commercials so you can skip forward or backward over commercials with one press of the remote button or alternatively you can set it to automatically skip over the detected commercials. 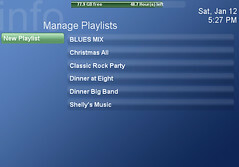 Completely configurable functions, keyboard shortcuts and menus. Integration with DVD Profiler for importing detailed information about your movie/video collection including movie title, details, genre etc. as well as an import of the DVD cover for each of the movies. 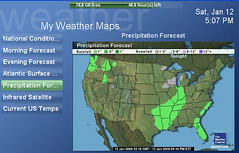 Integrated, customizable weather status on front page that can open up into an enhanced weather page with current conditions and forecast along with 10 day forecast and weather maps. 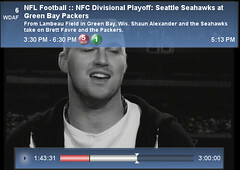 Built-in disk bar that shows the TV storage space in GB's and hours remaining for recordings. Configurable Date and Time on front page. 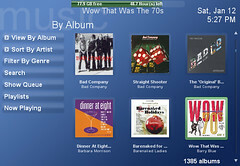 Built-in preview pane for viewing video content (or music details) while browsing the menus. NOTE: The latest version of SageMC was released this weekend and I'll cover it along with some exciting new features in Part 2 of this post. Before I go any further, here's a walk-through video to show you many of the screens of SageMC. I apologize in advance for my mostly monotone voice. I hate listening to myself on these things, but it was the best way to "talk through" the screens. First I'll run through the install process and then do a quick walk-through of the SageMC screens and finally cover the history behind SageMC. To expand any of the photos on this page and see a full-sized screenshot, just click on the smaller screen-shot. 1. 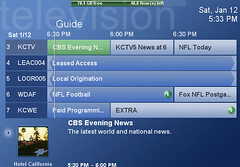 First you should have the latest version of SageTV installed and in working order. 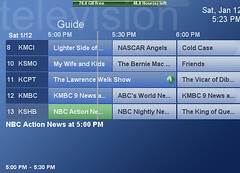 If you're new to SageTV, I recommend you get familiar with the default menus (installed when you first install SageTV). While you're at it, be sure you have your import folders (where you store your video, music and photos) set up and try out all of the features of SageTV to be sure everything is in working order. Exit SageTV and if you are running SageTV as a service, be sure you stop the service as well. 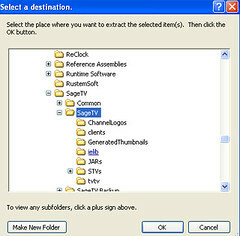 Copy the SageTV\SageTV directory to your backup directory. I save a different backup for each time I upgrade so I can go back a few versions if needed. That's it. If you ever need to restore your last version, just copy from the backup directory to SageTV\SageTV\ directory. 3. Make sure you are running Java version 1.6 Update 1 or higher - if not, download Java 1.6 Update 1 from Here and install it. 5. Make sure SageTV is still not running and then extract all of the SageMC files (the ones you just downloaded) into your SageTV folder (eg. C:\Program Files\SageTV\SageTV). you'll see the "are you sure you want to load this file and replace the application package (SageTV3.xml) currently in use?" Click on "Yes" here. 9. That's it! Right away you should see the difference. To me, this was the “oh now I get it” moment while testing SageTv. 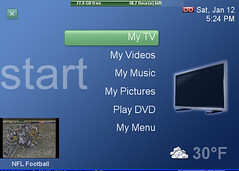 You see, in the past I never made it this far in testing SageTV and so I always saw it as kind of “clunky” and not really what I was looking for to “run my TV” so to speak. 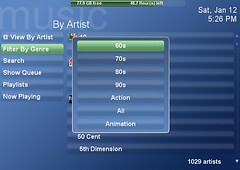 With SageMC, it starts to feel more like a polished media center software that belongs with my remote control and Television. 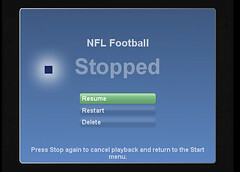 If you hit stop twice, you’ll skip this menu. Gives you a listing of upcoming shows with a summary and sometimes a photo. 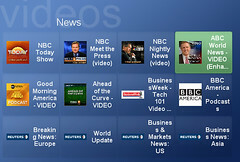 You can select any of these to view more detailed information on the show and setup a recording here as well. This shows you what will be deleted next if you run out of room, what you’ve watched (yes it’s a little big brother and this way I can see how many soaps my wife watched and how much tv my daughter is watching. This is a shot of the guide while video playback is still going. Note that this time I have SageTV set to put the video playback in a PIP type window instead of filling the entire screen behind the guide. While I’m at it, here’s a pic of the main menu showing the video pip window with a football game going on in the background. There’s a now playing screen for while you’re playing music. 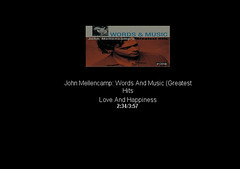 You can view this page by cover art or Song Detail. 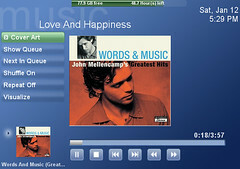 There are also visualizations such as the one below that moves the cover around during playback. 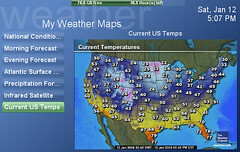 This first screen of the settings menu shows you the detailed system information. 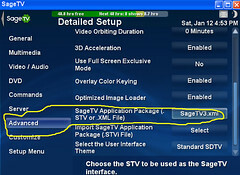 Notice it now says “SageMC STV Version: 6.3.6b”, this is the version of SageMC I had installed at that time. You can always get back to the “detailed setup” menu from the default SageTV interface from this menu if you need to. There is a “select theme” where you can choose from many different skins for SageMC. Under Main GUI, you can change the behavior, display, and menu animation features. It’s very configurable. which shows me how much space I have on my shows recording drive as well as how many default recording hours I have remaining. This is configurable as well. 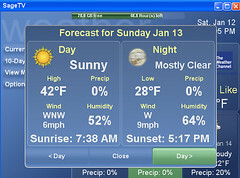 The weather bar (you see that at the bottom-left of the main menu and a RSS ticker can be turned on or off and configured here. Also available is an IMDB lookup that allows you to manually or automatically look up video, upcoming show and recorded show information from IMDB (internet movie database). 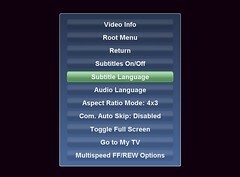 In the SageMC settings page, you can configure comskip (for commercial skipping) and you can set up multispeed FF/REW options to get smooth fast forward and rewind like I was used to in BeyondTV. Getting Movies Setup with genre’s, details and covers. You can use the “search IMDB” button to search for all movie details and download them one-by-one, but with my large library I preferred to use DVD Profiler (which I already owned) and connect it to SageMC. To do this you go to SageMC settings and paths, and under “meta data xml”, point it to the collection.xml file you exported from the DVD Profiler program. Now go to DVD Profiler path and point it to the directory that has the “dvd profiler\databases\default\”. Mine was in My Documents. 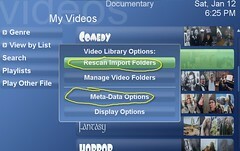 Now in MyVideos right-click with your mouse and select Meta-Data Options and do a DVD Profiler Refresh. 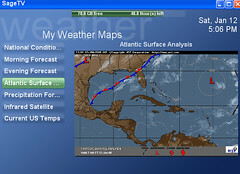 SageMC was created by a former SageTV user who goes by mlbdude back in 2004. mlbdude created SageMC (Sage Media Center) as a way to make the SageTV work more like the Microsoft Media Center interface. Stanger89 (another forum username) helped out by providing the java code that interfaces with the DVDProfiler data for the movies cataloging feature. If you would like to see screen-shots of SageMC as it was in its infancy through the end of 2004, check out this link on the sagetv forums. 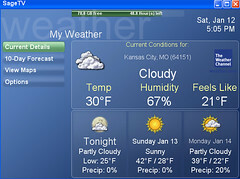 Ironically, mlbdude began using Microsoft's MCE in 2005 while he was still working on the SageMC interface. 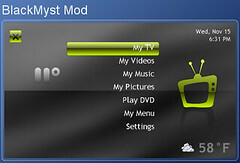 mlbdude's work (development and support) on SageMC was instrumental in making what I think is the most functional, flexible and visually appealing HTPC interface I've ever used. Sometime in 2006, Dirk Flachbart (known on the SageTV forums as "flachbar") picked up the torch and continued the development of SageMC. 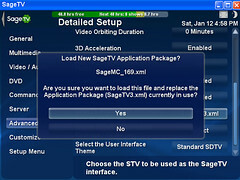 In May of 2006, Dirk began adding features to SageMC via separate "imports" to SageMC and after time with the permission of Mlbdude Dirk began developing those features directly into the SageMC STV itself. released a version of SageMC with updates made by him and has continued developing the SageMC interface up to this current version 6.3.7 that was just released this week. I should note that Mike (known as MeInMaui on the SageTV forums) has been working jointly with Dirk on the last two releases of SageMC. Mike approached Dirk with the ideas about making the main menu configuration and has been making most of the UI changes while Dirk concentrated on the necessary support in the java code.